When Aaron Burr left this elegant mansion, Richmond Hill, north of the city on the morning of July 11, 1804 it signaled the end of elegant dinners and diplomatic receptions in the grand home. Built in 1760 for British Major Abraham Mortimer, the estate was used briefly by Washington during the war and had been the Vice Presidential mansion for John Adams before Burr purchased it. John Jacob Astor acted swiftly to procure what he recognized as valuable real estate in the path of the advancing city. He purchased the lease on the land from Trinity Church for a staggering $140,000. The lease on the mansion cost him another $25,000. Astor immediately dissected the landscaped grounds with streets and building plots. Middle- and upper-middle class brick homes in the fashionable Federal style began cropping up, creating a new, comfortable residential neighborhood. By the middle of the 1820s the streets, now lined with homes, teemed with playing children and busy residents. Among the new houses was No. 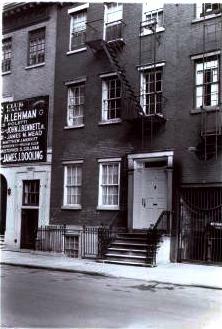 13 Vandam Street. Constructed in 1825 it was very much like its neighboring residences. While some of the similar houses had more ornate doorways and added architectural touches; No. 13 was simple and straight-forward. The two-and-a-half story dwelling sat over a stone English basement. Above the simple cornice one or two prim dormers pierced the pitched roof. The deep entrance sheltered an eight-paneled door under a leaded overlight. A handsome wrought iron fence decorated with palmettes joined delicate openwork newels at the stoop. 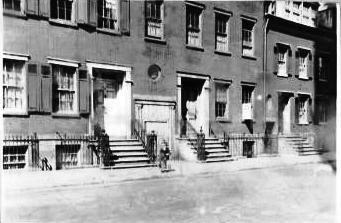 Before long the house was home to Mary Ann Hawkins, president of the headquarters of the American Female Moral Reform Society. Founded in 1834, the organization had as its foremost goal the elimination of prostitution. The members—who came from all social strata—recognized that chambermaids, milliners, servants and other low-paid workers were turning to prostitution simply to survive. At this time there were an estimated 10,000 prostitutes in the city. The determined women recognized that men where a large part of the problem. They lobbied the State Assembly to make it illegal for men to patronize prostitutes. They threatened to publish male patrons’ names in the Society’s semi-monthly periodical, Advocate of Moral Reform. And the righteous women marched into brothels in the seediest sections of the city to pray for the prostitutes and their clients. By 1840 the Society had 445 auxiliary branches and the Advocate of Moral Reform had over 20,000 subscribers. And then scandal struck. The pious minister had been embezzling Society funds. “Perfect integrity and uprightness of heart and action, are absolutely essential in one who holds such a trust—and where these are, or seem to be wanting, confidence must of course be withheld,” said Hawkins. And so scandal visited the door of the American Female Moral Reform Society in the form of a man. Four years later it would appear again in the shape of a woman. In November 1845 Mrs. Ruth Beatty, the treasurer, was accused of misappropriating funds intended for a school in the Sandwich Islands. Mrs. Beatty had been entrusted with $772 of which $327 was missing. But despite the scandals, the Society pressed on. In the 1850s its middle-class members had become experts on the social problems effecting working-class women including working conditions, housing and homeless children. As the century came to an end the family of John McKnob was living at No. 13. It was about this time that a full third floor was added along with a robust Victorian cornice. Plain, flat lintels contrasted slightly with the originals. The McKnobs were followed by John H. Holder and his wife Mary. The parlor was the scene of Mary’s funeral on Monday morning, March 9, 1914, followed by a requiem mass at the nearby St. Anthony’s Church. As New York City did what it does best—tear down buildings to build new ones—it somehow mostly ignored little Vandam Street and its neighboring blocks laid out by John J. Astor a century earlier. Two years after sculptor Mrs. Stick opened her gallery in No. 13 with her husband, Hugh, the Landmarks Preservation Commission designated it part of the Charlton-King-Vandam Historic District. “To walk these streets is as delightful and unexpected a step into the past as to walk up Cheyne Row in London,” it noted. Now a two-family house, No. 13 Vandam retains its original wrought iron fencing and newel, its handsome old door and all of its charm.